Brick wall repair methods for structural brick walls & brick veneer walls vary depending on the type of damage that is being addressed. Reinforcement or even reconstruction are required in cases of severe structural damage or unsafe buildings while other types of brick wall repair such as re-pointing or crack repair or lintel repair are often possible in-situ. 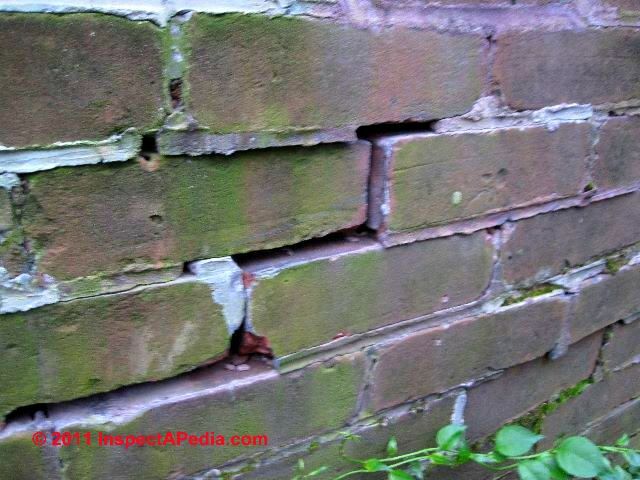 This article series explains types of damage to structural brick walls. We explain how to recognize, diagnose, & evaluate movement and cracks in brick walls and how to recognize brick wall bowing or bulging and cracking failures. The article series includes identification of types of foundation cracks, crack patterns, differences in the meaning of cracks in brick structural walls or brick veneer walls and discusses cracks or movement as evidence of building movement. 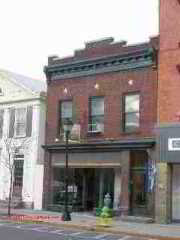 In our photo of an antique building in Hudson, NY (at left) those three "stars" shown above the three windows of the second floor are probably functioning as giant "washers" securing a front-to-back anchor that secures the front wall of this structure against bulging or movement, possibly also securing the floor structure inside as you can see in the sketch at left. The drawing at below left, from Carson Dunlop Associates, shows how a structural brick wall may be reinforced laterally using a steel tie rod. see BRICK WALL THERMAL EXPANSION CRACKS which includes brick veneers and types of veneer damage. Brick walls that have lost mortar from the joints between bricks or brick courses may be repaired by re-pointing or "tuck pointing", a procedure that cleans and then replaces mortar that has been lost from joints. Our photo of a tuck-pointed structural brick wall (left) shows by the colored mortar that the mason attempted to match the color of older mortar in the wall. The repairs done at below right look good. But a different tuck pointing repair job (in the upper left portion of the photo where we are pointing to a damaged brick) has not fared as well, possibly due to a poor mortar choice and frost damage. Tuck pointing is the filling in with fresh mortar of cut-out or defective mortar joints; in masonry this refers to the filling of joints in old (or damaged) masonry with fresh mortar. 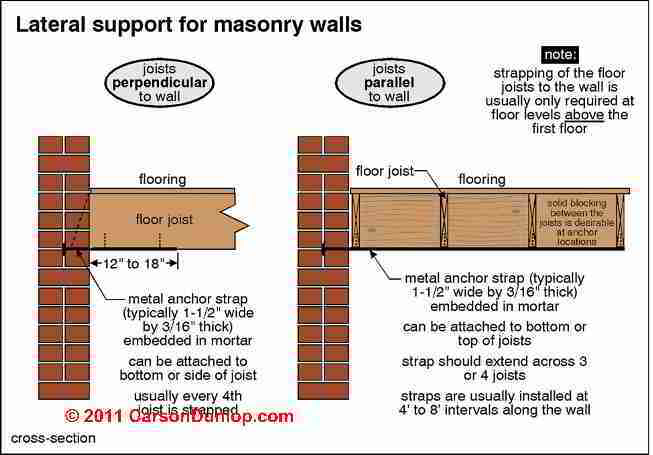 - Masonry Design Manual. 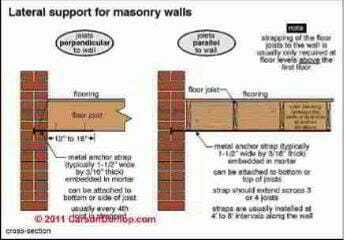 To stabilize the brick foundation or wall against movement. Our photo (left shows severe water and frost damage to the corner of a brick building, probably from roof spillage at the end of a gutter that was periodically clogged. 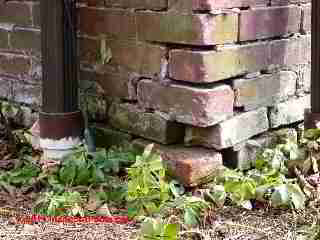 To stabilize these bricks against further movement and possibly more serious foundation damage, a mason would probably repair the corner using a combination of reconstruction of the most-loose (or missing) bricks, and tuck pointing the remaining open mortar joints. At left we show a bad brick wall repair, tuckpointed using a too-hard mortar mix for a loose brick mortar joint repair that also is not matched in the slightest to the original wall's mortar joint color, texture, nor tooling. This expedient repair invites further frost damage to the wall as well as to the brick surface. This wall was ultimately re-built over a substantial area damaged by water and frost. Working with a long narrow trowel whose width and shape are chosen to match the existing mortar joints, the mason first cleans the existing mortar joints of loose mortar and debris, then pushes fresh mortar into the open joints. The mortar joint in the tuck pointed wall should tooled to match the existing mortar joints, and any mortar that has spilled onto the brick faces themselves should be cleaned before the new joints have fully hardened. When I [DF] have done tuckpointing or re-pointing of brick walls I prepared (thanks to advice from Eddie Kondysar, a real mason) mortar of the proper color, texture, and hardness to closely-match the original building mortar. After cleaning the very soft mortar from the bad brick joints I held my mud hawk against the wall surface at the bottom of the mortar joint and used the pointing trowel to push mortar into the joint, getting as little mortar as possible on the face of the bricks. When the joint was filled to a proper depth I tooled the joint (flat, concave, angled in at the top of the joint, or special tooled or lined) using a trowel that matched the profile of the original brickwork. When the mortar was set if there was a mess of mortar on the brick faces I used a bit of muriatic acid to clean the brick to leave a beautiful job. Watch out: working with muriatic acid is dangerous and can burn you or put out your eyes. Use appropriate protective gear. Mortar that is not matched closely in original color makes for a wall that is cosmetically unattractive. In our photo of a tuck-pointed brick wall (Wappingers Falls, New York) shows the effects of using a too-white mortar to "repair" the gable end wall of this home. Mortar that is not properly matched in hardness can cause serious spalling damage to a brick wall, especially in freezing climates. When the new mortar is too hard and too waterproof in comparison with the surrounding brick, moisture that penetrates the brick wall remains trapped behind the harder mortar. In freezing weather the expanding strength of ice pops off surfaces of the softer bricks, damaging the wall further. Using caulk or sealant where mortar should be applied: when you apply a caulk or sealant to a brick or standstone (and some other stone) surface most likely you'll find that weathering of the softer stone, brownstone, or sandstone surface will cause the edges of the sealant or caulk to open up and pull away from the building surface. See CAULKS & SEALANTS, EXTERIOR but use a properly-formulated mortar not caulk when re-pointing is needed on brick. Failure to clean the brick joints before tuck pointing, resulting in short life for the tuckpointed "repair"
The brick veneer wall shown in our photos (below) was rebuilt after a partial collapse. You can see some of the original veneer bricks on the ground. Add fasteners for a brick veneer wall that is loose: Other loose brick veneer walls that are not bulged or badly damaged but are poorly supported on the building structure can sometimes be repaired using special fasteners (e.g. Fero Engineered Masonry Connectors cited at REFERENCES) that mount through mortar joints and connect to the building structure behind. Brick veneer wall drainage repairs: a brick veneer wall that is not draining properly may be repairable by adding drainage openings or clearing blocked drain openings. Re-construction of all or part of the brick veneer wall: a brick veneer wall that is extensively damaged, bulged, loose and collapsing will probably need to be removed and rebuilt. Continue reading at BRICK WALL LEAK REPAIRS or select a topic from closely-related articles below, or see our complete INDEX to RELATED ARTICLES below. 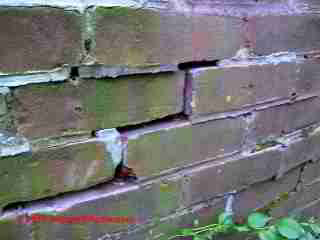 BRICK WALL REPAIR METHODS at InspectApedia.com - online encyclopedia of building & environmental inspection, testing, diagnosis, repair, & problem prevention advice. "Inspecting Block Foundations," Donald V. Cohen, P.E., ASHI Reporter, December 1998. This article in turn cites the Fine Homebuilding article noted below. Watch out: this manual may include opinions and recommendations that are obsolete or even very dangerous. For example p. I-4 expresses the opinion that "buckling is not a serious condition in masonry ..." contrary to the direct experience of masonry experts who report cases of catastrophic building collapses.